2/18/2013: Back in 2008 Frohnmayer and Kilkenny were flashing around a consultant’s report predicting that Matt Court Arena revenue would be between $10M and $16M a year. But they were hiding a more substantial report with drastically lower projections: $6M to $8.6. I also sent it to the Oregon legislature’s bond analyst, who then vetoed Frohnmayer’s scheme to finance the arena with tax-exempt revenue bonds: not enough revenue, the IRS would be all over us. Instead they had to sell regular taxable bonds. $235 million of them. Sure the athletic dept pays all its operating expenses. I’ll have a motion in the Senate next meeting showing just how exaggerated that claim is too. Then there’s this quote from the OUS VP for Finance, explaining how the $235 million in bonds has left UO unable to borrow money for academic purposes – those little niceties like classrooms. Matt Court Arena – another one of Phil Knight’s gifts that just “keep on taking”. And don’t miss the report by Matt Walks and Aubrey Wieber on the disaster that is Paul Westhead, also in the ODE. 11/6/2011: Ohio State has just borrowed big to fund an expansion of the academic side. Fascinating Oregonian column by David Sarasohn here on the very unusual 100 year bonds. (Yes, we know Frohnmayer sold $230 million in bonds for 2008, but that was for a basketball arena – although tuition money guarantees the repayment.) You know President Lariviere with his New Partnership, and Governor Kitzhaber with his 40/40/20 plan, are watching to see how this goes over. And so is UO’s Athletic Director, Rob Mullens – who may well want to soon call on UO’s borrowing authority to expand Autzen Stadium. Especially now that he knows how easy it is to trick the academic side into repaying athletic department debts. Matt Court worth more than 300,000 children. An initiative passed several years ago mandates all schools be upgraded in Oregon by 2032, a two billion dollar program. As of this writing we have allocated a total of $15 million with another $7.5 million to be allocated (if the bond sale actually goes through) this spring. The State Treasurer has advised the state that we cannot issue any general obligation bonds without endangering our bond rating and driving up interest rates – making them more costly to finance. So schools, emergency facilities, dams and bridges are just going to have to wait. However, in the last session, knowing that the economy was still taking a dive, the state used up $200 million of its bond capacity to finance a monument to Phil Knight at the University of Oregon – because Phil gave the athletic department $100 million – none of which, however, could go to pay any of the capital costs of the new Knight Arena. It’s about values and money – and a guy like Knight who has the money, gets to dictate the values. Because apparently, the Oregon Legislature values U of O basketball more than the potential of losing 300,000 school children’s lives in a major earthquake. This is a little over the top, even by my standards! And now Bojack reports Mr. Williams is denying he wrote it. OK. The safety concerns of Mac Court have been mentioned by President Frohnmayer and other UO officials as a reason why a new facility is urgently needed. Our subcommittee made an effort to evaluate the safety of Mac Court. We were informed that Mac Court, like all university buildings, is subject to building inspection, fire alarm inspections, fire sprinkler inspection and testing. In addition, fire pumps, standpipes, and fire extinguishers are inspected and tested per the fire codes. It is also noteworthy that the safety issues for Mac Court are quite different from other campus buildings given that the capacity of the facility is large but the usage is infrequent relative to other campus buildings. Our subcommittee focused on the seismic risks, because the danger of earthquake threatens all University buildings, and because studies have been done that compare the risks of various university structures. On October 18th the subcommittee invited Chris Ramey, Senior Architect and Director of University Planning, to a meeting to discuss seismic risk studies and renovation potential for Mac Court. Mr. Ramey referred us to the University of Oregon Natural Hazard Mitigation Plan published in Winter 2006, which includes a detailed building by building assessment of Seismic risks (see page 7). The seismic risk of McArthur Court is not at the level of the structures which are of greatest concern (darkest purple on the map) and is in about the middle of the pack overall. According to the plan, buildings that are at a higher priority for additional seismic assessment and reinforcement include Esslinger, Friendly, Fenton, Hendricks, Knight Library, Lawrence, Susan Campbell, and Volcanology. 9/29/2010: Utterly unsurprising news in the RG today. The arena is not going to bring in the revenue Frohnmayer promised when he was selling the bonds to the legislature. And Chip Kelly needs another big raise to keep him on board. So the ticket money will go to Kelly, and the reserve fund – the principle, not just the income – will be used to make the bond payments. They are looting the reserve to pay their salaries, and when that money runs out they will run too. You can bank on it. 8/4/2010: At Missouri State, we mean. Change a few names and this story from the Springield Missouri News-Leader is eerily similar to the ones Ryan Knutson wrote for the Oregon Daily Emerald. UO’s current plan is to subsidize our new Arena on the sly, by increasing student and faculty/staff parking fees and by having the UO general fund pay the jock box operating costs. We haven’t heard any reports on how Matt Court ticket sales are going, or how quickly the “Athletic Legacy Fund” will be drained. When that money’s gone they can fall back on the $1 ticket surcharge they are – supposedly – squirreling away in a rainy day fund. James Cofer, the new president, plans to review the finances of JQH Arena, which outgoing president Mike Nietzel had promised would pay for itself. “I’m not promising anything at this stage,” said Cofer. But he added he believes the arena is an asset to the university. “It’s important we utilize that asset,” said Cofer. Attendance at the arena is not bad, but Cofer said he would like to see more people. The financial viability of JQH Arena became controversial after economics professor Reed Olsen last fall contended it lost $400,000 in its first year of operation. Nietzel in 2006 said JQH Arena would pay for itself and have no impact on the rest of the university budget. There is no binding contract that JQH Arena would be self-sufficient financially. Nietzel refuted Olsen’s claim, arguing JQH Arena had a $1.1 million surplus after its first year. In his calculations, Nietzel counted $1.4 million in one-time interest income, which drastically cut the university’s debt obligations to $700,000 in the 2008-2009 fiscal year. Financial statements of the arena also show a student fee has been reallocated to support the basketball facility. In 2006, the Faculty Senate charged its budget and priorities committee to monitor the arena’s financial status, but last spring the Faculty Senate agreed the task would be pointless after the leadership change, because the new president is not bound by his predecessor’s promise. On Friday, Cofer said JQH Arena would stay within the university budget. He said he would review how revenues, such as student fees, and costs are allocated between JQH Arena and Hammons Student Center, the old basketball arena. Thanks to Margaret Soltan for the link. “The amount of time that it’s taken to get a public records request processed is far longer than we are used to dealing with,” Bonham said. “For this institution to be not completely transparent and forthcoming is a concern for the public.” The University general counsel’s office, which handles public records requests for the University, did not return calls seeking comment. 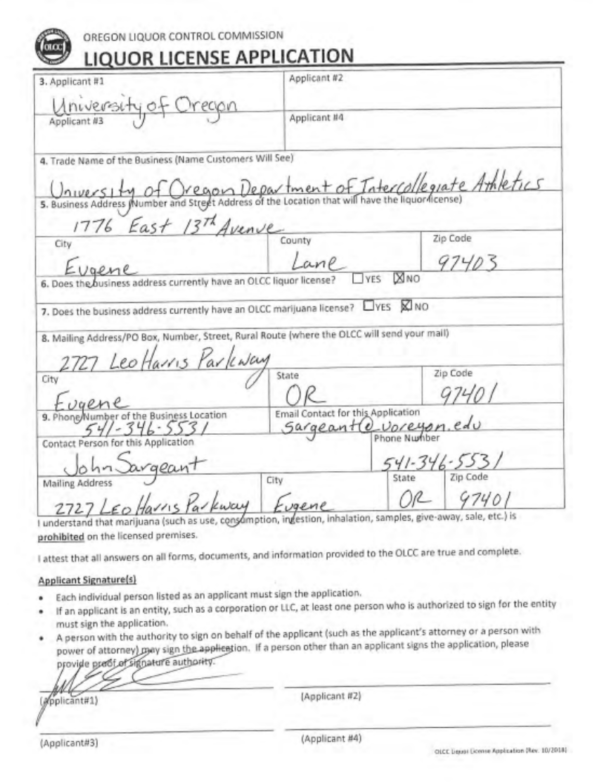 For the record, The UO official in charge of public record requests is Doug Park, dougpark@uoregon.edu, (541) 346-3082. Doug doesn’t sign his name to public records responses, and likes to use the email address gcounsel@uoregon.edu instead of his real one. I’m not sure if this is because he is embarrassed by what his boss Melinda Grier makes him do for a living, or is just trying to forestall an ethics investigation over the details. So the projection is for $4 million in net revenue, for $15 million per year bond repayments. When the State Treasurer’s office finally saw this report they refused to allow UO to sell the bonds as tax-exempt, because these numbers mean the IRS could have argued this was tax arbitrage, and imposed millions in penalties on UO. I wonder what Melinda is hiding this time?